Ibn Battuta was a Moroccan scholar who traveled the medieval world. One of the greatest quotes he left us with is “Traveling — it leaves you speechless, then turns you into a storyteller.” As an avid traveler myself, I truly have encompassed the feeling of breathtaking views that leave my mouth with no words to say in the moment. My previous blogs, and future blogs embody the experience of travel, and allow me to share my opinions and knowledge of various locations with you all. One of the most stunning places I’ve traveled to is Greece. There’s nothing like taking a bite of a mediterranean meal while looking out to a great view of blue water, rugged mountains, and tranquil beaches. If you’re planning a trip abroad, let it be Greece. The greek meaning of Peloponnese is “Island of Pelops” who was a legendary hero said to have conquered the island. In addition to Pelops, this island has a more familiar story of history — that being the place where Hercules roamed and battled. Celestial and mythological enticement aside, Peloponnese has plenty to offer. One of the best sites to see here is Ancient Olympia. This historical sanctuary site was dedicated to worshiping the greek god, Zeus, who was the father of Olympian gods. On top of ancient historical sites, Peloponnese also has more modern views. From beaches to top-notch vineyards, you’ll have an experience to talk about. The views are something you’ll pine after for years to come after your trip. 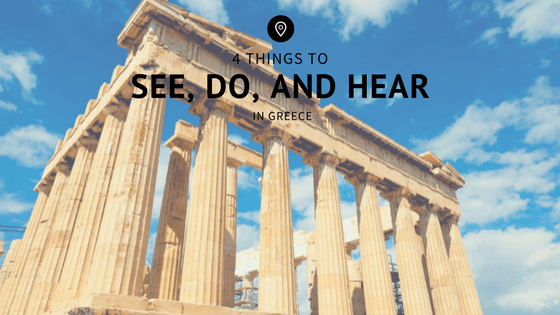 Athens is full of things to explore. Multiple museums, temples, Acropolis and more will keep your eyes glued to rich history. Being a highly attractive location to tourists, Athens offers both public and private tours. You can live like a local Athenian to popular sites and hidden gems from the city to the sea during your visit. Athens even has the Acropolis museum with plexiglass material that allows tourists to see live excavation right under their feet. Whether you’re a fan of ancient ruins, delicious food, booming nightlife, or tranquil waterscapes, Athens has an adventure waiting for you. When looking for a place to stay in Greece, Crete should be your top choice. Dual views of coastlines and mountains make Crete a stunning scene. Coffee lovers love Crete for it’s outdoor coffee shops and quaint villages conveniently located more populated metropolitan areas. Being the largest of the Greek Islands, you’ll have a hard time picking between all of the amazing places to stay during your trip. This Top 10 Tourist Attractions in Crete also provides places to stay near each location. Listen to the waves crash against the boat as you sail your way around Santorini. Go on a relaxing cruise, sailboat, or water tour in Santorini, Greece — the most visited island in all of Greece. Now, don’t let that turn you away. With a sailing trip, you’ll beat the tourists for a quite, enjoyable vacation. Enjoy the afternoon out at sea or set sail at sunset. This affordable, relaxing experience is one that attracts visitors of Greece for a voyage of a lifetime. Shane Krider is a successful personal development life coach, producer, speaker, author and entrepreneur. Along with his wife, Shane is the co-host of Born to Prosper’s Mind Power, which is a self-help podcast which challenges its listeners to delve deep into their minds to find success. In addition, Shane travels the world in luxury to speak to aspiring entrepreneurs at conferences and workshops to inspire them to find their own pathways to success. Shane Krider is part of The Prosperity of Life Network, a United States-based personal development business with a presence in 52+ countries.